Begin by frying a couple dozens large shrimp using the Gaspard's Spicy Catfish Nuggets recipe (just substitute shrimp). Deep fry until they float to the top. Prepare a dozen at the time and don't over-cook. When a light golden-brown color is reached (about 3 minutes at 375 degrees F.) remove the shrimp from the hot oil with a slotted spoon and place them onto some paper towels to cool and to absorb any excess oil. Repeat the process until all the shrimp are done. Purchase the garlic French bread already sliced in half (lengthwise). Use your oven broiler to lightly toast the garlic loaf (spread side up) and set aside. Later, when you are done, you can slice the loaf in half to make two equally proportioned po-boys. On the bottom-half of the loaf, evenly distribute the shredded lettuce. Then on top of the lettuce arrange the tomato slices along the entire length of the sandwich. On the top-half of the loaf spread a generous amount of tartar sauce. 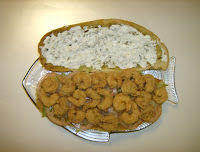 Complete your sandwich by arranging the fried shrimp on the bottom-half of the loaf, season to taste, put the bread-cap back on, perform your final cut ... and Voila!--two Shrimp Po-Boys...Cajun style! (if you end-up with a few left-over shrimp just eat them as a snack and enjoy) Ahheee!! C'est Bon!